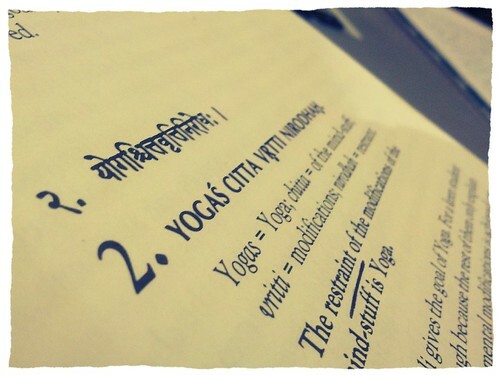 I’m studying the Yoga Sutras of Patanjali again these days because sometimes I need to remind myself of why I practice yoga and why I teach it. Although I’ve been steeped in yogic practice and philosophy for nearly half my life, sometimes life gets chaotic, and I lose focus. On this latest return to the sutras, I’ve been moved to write some reflections on them. I’m no sanskrit scholar or philosopher, but the great thing about the sutras is that you don’t have to be those things to learn from them. They have something to offer us at every stage of our practice. I’ve written before about sutra 1.1, so today I want to share my reflection on sutra 1.2. The mind is a busy thing. It is always moving. Even when we sleep, the mind is fluctuating, making up little stories, tossing flashes of color and light around, reenacting or inventing conversations and scenes that feel like reality while we’re experiencing them. Only when we wake up do we realize our dreams were “just dreams,” no matter how real they felt. We’ve all heard of lucid dreaming, right? Some people learn to recognize that they are dreaming while it’s happening, and that changes the dream. Similarly, we become lucid in our waking life when we learn to tell the difference between what is real and what is just mental noise. The same practice can be applied to many areas of life. If you’re driving and someone cuts you off, you get mad, right? You think, “Wow, that guy drives like a jerk! Why didn’t he look where he was going? And then he had the nerve to honk when I passed him! I hate people.” But you know the way someone else drives doesn’t have anything to do with you. And in reality, you probably don’t hate everyone. The truth is, we may feel and think a lot of different things depending on our circumstances, and while we can’t always control our circumstances, we have a choice about how we respond to them. We can choose to indulge negative, fatalistic, and panicked thoughts, or we can let them go. Our perception of reality is strongly colored by our choice of thoughts. This is one of the simplest truths in the world and one of the hardest things to remember when the going gets tough. That’s why we have our yoga practice to use as a tool. Asana (poses) helps us create the link between mind and body. This helps us to stay present in the moment and to gain control over the fluctuations of the mind. As we create a state of ease and health in the body, we also create a sense of peace and quiet in the mind. Only when the mind is quiet can we begin to experience true yoga or union. So … How can I apply this to my life right now? Having recently been struck with a sneak attack of the flu, I need to slow down and be quiet for a while. Rather than pushing harder, teaching more classes, perfecting harder poses and so forth, I need to reconnect with that deep well presence. I’ve been pursuing the career side of things, the outwardly visible trappings of so-called success rather than focusing on my own basic wellbeing. That’s essentially the opposite of what my yoga practice is all about, so even though it may look like I’m doing tons of yoga, keeping up this pace for too long can become counter productive. Luckily, this little virus came just in time to put me back in line without doing too much damage. Now, it’s time for more self-care, rest, and quiet reflection.